To make the chutney, place a colander over a bowl and grate the cucumber into it, allowing the excess water to drain away. Place all the other ingredients into a pan and bring to the boil then leave to cool. Once cooled, place the drained cucumber into a clean bowl and pour the liquid over it. Mix together so that the cucumber is submerged, and set aside. To make the horseradish yoghurt, place the yoghurt and horseradish in a bowl and mix together. Pass through a sieve then season with salt to taste. Set aside until serving. To cure the mackerel, place the salt and sugar into a bowl and mix together. Lay the mackerel out on a tray and sprinkle the mixture evenly all over it. Cover and leave for 30 minutes to cure. Wash the mackerel off thoroughly in cold water and pat dry with kitchen towel then sprinkle it all over evenly with the dried seaweed. Pre-heat your grill on the high setting. Drizzle a grill tray with oil and put the fish on it skin side up. Place under the grill and cook for 2-3 minutes until the skin is golden and blistering. 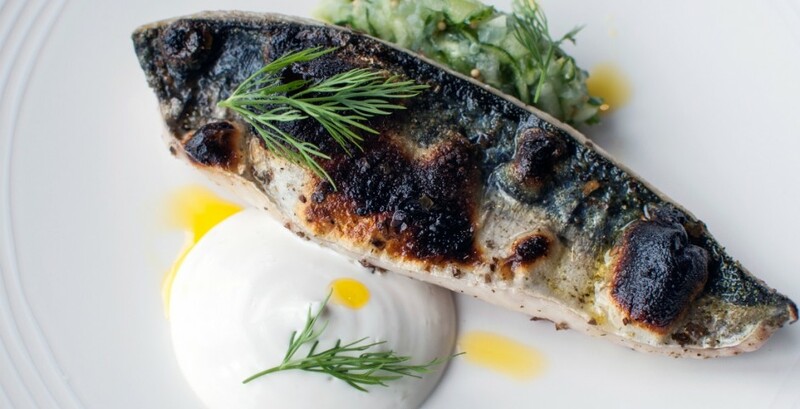 Place each mackerel fillet on a plate and add a spoonful of the horseradish yoghurt and a spoonful of the cucumber chutney. Finish with a few sprigs of dill and a drizzle of Cornish rapeseed oil.